Amazing overhead views of marine life, including those scary sharks with no eyelids! I need to note that we went in August, when almost all the schools in the area are back in session. This meant that the crowds were far smaller than you might expect, even when you see a field trip enter alongside your party of four. My son is a water baby. Since his brother was already in school, I decided it was time to take the plunge and take the boy there. Man, he was excited! When we left, he actually thanked me for taking him there. There are few times when a four year old will — voluntarily — thank you for something, and this was one of them. Do I have enough space? There’s a massive “dive” tank with a cool coral reef, and you can often see a human diver in the tank scrubbing the walls down from the inside. Another room over, there’s the ginormous tank that holds the whale sharks, several other types of sharks, manta rays and the biggest “baby” grouper you’ve ever seen. Carla and I, being our usual snarky selves, wondered how many hushpuppies you would need to serve with it. Does anyone else think of Sponge Bob when they see jelly fish? The seven-year old is enthralled with jelly fish, so we got to see tons of those. They’re really cool when they’re behind glass and not stinging you at the beach. The Aquarium has a new penguin exhibit, and now also houses sea otters. Oh, and did I say I fed a small ray a piece of fish? Yes, I did! 8 if you’re doing the tourist thing. 10 if you’re really into aquatic life. 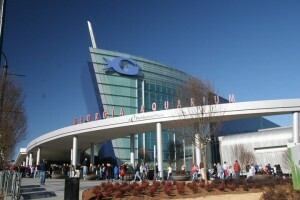 The Georgia Aquarium opened in 2005 in downtown Atlanta. It was a gift to the state from Bernie Marcus, that dude who founded Home Depot. Be sure to secure a line of equity before coming to the Aquarium. Ticket prices are steep, parking is $10 onsite, and the Wolfgang Puck cafeteria prices are insane. This is definitely a splurge visit. Contrary to popular belief, African penguins actually live in warm climates. Like Georgia, for example.